At a presentation in connection with the exhibition, Xiao Rong Coutin made hand-pulled noodles, which were topped with a sauce that included soybeans and pork belly. I THOUGHT I knew a thing or two about Chinese food, until I discovered the recipe for rancid bear paw. My 15-year-old goddaughter was in town and we were touring an exhibition on the culture of cooking and eating in China at the Quai Branly museum near the Eiffel Tower. The show was being advertised in Metro cars and on billboards as “Les Séductions du Palais” — which could mean either “The Seductions of the Palate” or “The Seductions of the Palace.” We were intrigued. Most of the 150 artifacts on display belong to the National Museum of China in Beijing, which had never lent them to a European museum. So when Jean-Paul Desroches, the curator of the Guimet Museum of Asian Arts, who organized the exhibition, offered a private tour, we couldn’t say no. We were in a room on “Power, drunkenness and divination in the Bronze Age (circa 2000-221 B.C. ),” contemplating the bronze drinking vessels and ritual plates, when we spotted a panel with a recipe from the Shang dynasty (1570 to 1045 B.C.) for bear paw. It was not until then that meat became a key part of the diet of aristocrats. Bear paw was a dish appreciated by King Zhou, the dynasty’s last king, who made his reputation as a torturer, a drinker and a host of extravagant orgies. The recipe was straightforward: 1 bear paw, 2 ounces of honey, 1 teaspoon of salt, 20 ounces of chicken broth,1/3 ounce of ginger and 7 ounces of grain alcohol. The paw was to be peeled and cleaned, coated in a thick layer of honey, cooked in a pot at low heat for an hour, rinsed, then simmered for three hours in a pot with the chicken broth and seasonings on the embers of a fire. It was the prep that threw me: “Clean the paw with paper. Don’t use water that might contaminate it. Put some lime in a bowl, then add a thick layer of fried rice. Place the bear paw on the rice and cover it with another layer of rice. Put a lid on the bowl and seal it with lime. Mr. Desroches said the exhibition catalog contained 32 recipes. (Only the French would put recipes into an art catalog). Alas, they all were rather banal: chicken in cashew nuts; spinach and tofu soup; that sort of thing. No bear paw. Economic: In China, livestock farming was less developed than in France, so meat was scarce and had to be stretched by blending it with other ingredients. Philosophical: Each meal must contain all five elements (metal, wood, water, fire, earth) and be as balanced as possible (the yin/yang theory). Aesthetic: Chinese cuisine is more artistic than French, because the individual ingredients disappear to create a new taste — an art as admirable as painting or poetry. Demographic (my favorite): China has always been an overpopulated country, so people were forced to be creative to survive. “We would therefore eat whatever we could find: chicken feet, fish livers and scales, jellyfish or beef stomach, which would probably be judged inedible in the eyes of Westerners,” he wrote. Bear paw, a delicacy available only to the rich, was not on the list. I found what I was looking for in the “Great Dictionary of Cuisine,” the 1873 encyclopedia and cookbook by Alexander Dumas, the novelist and playwright (and expert cook). Dumas wrote that in ancient times, frontal bear paws were considered the most delicate part of the animal, that rich Germans highly valued bear cub flesh and that bear ham had become a refined but easily accessible dish on European tables. Bear paws are still a ritual dish for the Chinese and are common on the black market. In June, police in the autonomous region of Guangxi Zhuang dismantled a ring of traffickers in endangered animals and seized hundreds of bear paws and an unknown quantity of bear meat. All this talk about food made me hungry. So I signed up for a Chinese gastronomic tasting at the Quai Branly museum in connection with the exhibition. Among the offerings were pâtes vivantes (living noodles). The long, thick hand-pulled noodles called mian start as a thick dough of wheat flour, eggs, water and salt, mixed by hand and set in a shallow round tin for four hours. 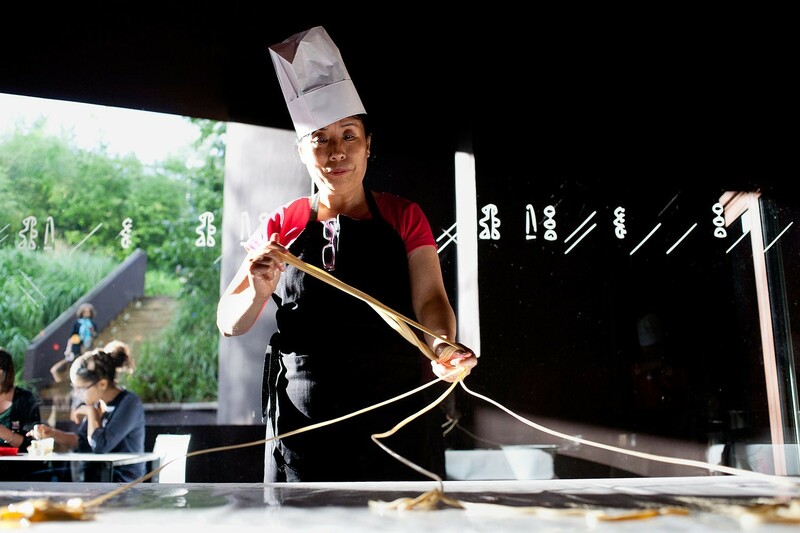 Xiao Rong Coutin, the 55-year-old founder and owner of two (soon to be three) Paris restaurants called Pâtes Vivantes, lifted, pulled and slammed the dough, until it morphed into a web of noodles that stretched wide in her arms. They were plunged into boiling water, drained as soon as they became springy and chewy (not merely resistant like al dente pasta), then topped with Zhajiang sauce (grain vinegar, soy sauce, red pepper, crushed soybeans, pork belly, leeks, ginger and garlic). The quicker and hotter they were eaten, the better. My friend Jean-Claude Ribaut, Le Monde’s food critic, who had come along, agreed that the noodles were good, but decided we were in need of a proper Chinese banquet. So he invited me to Chez Vong. The Cantonese restaurant, on a rundown street near the site of the old Les Halles food market, is decorated like an old Chinese inn, with stone walls and wooden beams and antique green tiles. It is not a place for light appetites or slim wallets. We started with several varieties of steamed dumplings served with flowers sculptured from carrots and turnips, and moved to crispy shrimp croquettes surrounded by watermelon balls. Then to frogs’ legs in five perfumes set in a nest of parsley and two interlocking sculptured eagles made of sweet potato; then sea bass in a white coconut milk and curry sauce. It was all a prelude to the Peking duck, first the crispy skin served on delicate rice pancakes, then the flesh served two ways: sliced, and sautéed with vegetables in a basket made of woven fried potato. There is no one else in my life who would dare say such a thing to a restaurateur. The couple nodded solemnly. Jean-Claude smiled and assured them, again, that the dish was excellent. A 220-pound Buddha that Mr. Vong once sculptured from butter imported from Australia (and that truly looked alive) seemed to be laughing along with us from his perch behind glass. “He’s gotten thinner over the years,” Mrs. Vong joked. Would that it be so for mere mortals like us.